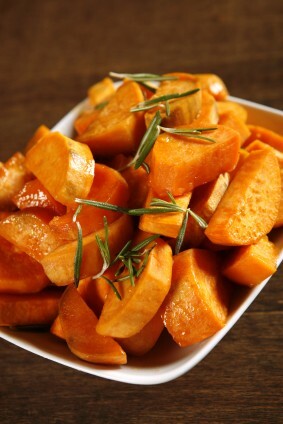 Our stove top sweet potatoes recipe is an delicious easy vegetable side dish. The orange juice and brown sugar add to the wonderful sweetness of this vegetable. Cinnamon and allspice round it out. Cut the potatoes into large slices then cut the slices in half. Bring 1 inch of water to boiling in a large skillet. Add sweet potatoes and reduce heat. Cover and simmer for 20 minutes or until potatoes are tender. Drain well. Meanwhile, for the sauce, in a small bowl combine orange peel, orange juice, molasses or brown sugar, salt, cinnamon and allspice. Pour over the cooked potatoes in the skillet. Bring to a gentle boil and simmer, uncovered, for 5 minutes or until potatoes are glazed, spooning sauce over the potatoes occasionally. Substitute molasses for the brown sugar for an even deeper, richer flavor. The combination of ingredients in this recipe makes for a side dish that even vegetable phobes may love. 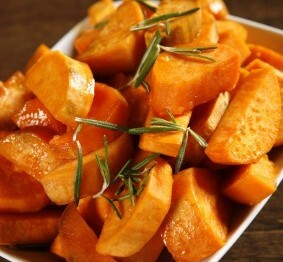 This is a wonderful vegetable side dish recipe for holiday dinners when sweet potatoes seem a natural on the menu. Find the rest of our sweet potatoes and other vegetable recipes here.